This past weekend, Grand Cochon took place with ten of the winners from their regional competition, COCHON 555. The final competing chefs prepared show-stopping dishes using whole heritage-breed pigs in a head to tail showcase for a crowd of pork-loving gourmands, that took place hosted last Saturday, June 18th during Food & Wine Classic in Aspen. One competitor of Grand Cochon that threw COCHON fans in for a loop was Chef Diego Oka of La Mar by Gaston Acurio. La Mar is ruling the Peruvian game where Oka's specialty is not pork but, seafood. According to Chef Diego, La Mar doesn't even have pork on their menu. 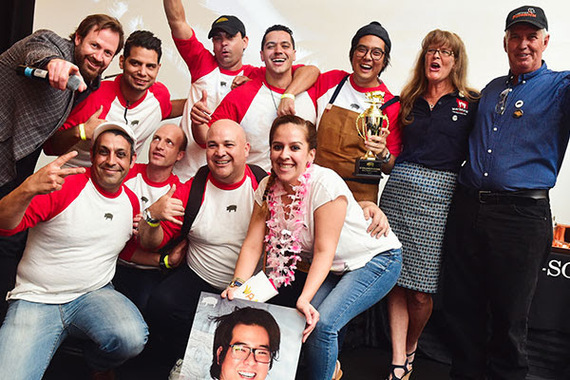 During his first year of participating of COCHON 555 in Miami, he won over the crowd with a Large Black Breed of pig raised by Maverick Meats/FKS Farms. The event benefitted the Piggy Bank, a farm devoted to providing free heritage breed pigs and business plans to emerging family farms. Even though Chef Diego didn't win Grand Cochon his dishes had standing ovations featuring Quinoa Tamales stuffed with Peruvian corn called mote, aji panca, pig face and feet wrapped in banana leaves. Adventurous eater extraordinaire, Chef Andrew Zimmern posted a photo on Instagram of the Miami challenger's Stuffed Pepper captioning it, "brilliance." Before the Peruvian prodigy went up to Aspen to battle out all things pork, he shared some insight on the culinary competition and his strategy. Will any of your winning dishes from Cochon 555 be available at La Mar? Our new menu launched June 7th and we added one of the favorites which was the quinoa tamale! I love your Korean Fried Chicken, Chaua Aeropuerta with Chinese Sausage and Lomo Satlado but, many of your fans know you more for seafood. Were you nervous to take on the challenge of only cooking with pig? Yes, I was nervous to participate in general, but also it was a great opportunity to show that I can do more than seafood. Most of our menu is based on seafood but, we also served different kinds of protein, I think now more people are going to know that we not only have great cebiches, that we also have amazing tamales! What is your favorite part about the overall Cochon 555 event? First, it has to be about gathering with my team and having the same goal and pushing it to be the best. Second would be interacting with new people that were costumers of La Mar and giving them non La Mar dishes. Overall been in the event is lot of fun! How did you prep for this year's Cochon 555? At first we were brain storming about what we wanted to do. Then we asked, what do we want to show to the judges and guests?. At the end I decided that we have to showcase Peru but, with a twist, so I picked my favorite peruvian pork dishes and then we made little changes, I think it worked! What is some advice you would give other chefs in the future who will participate? At the beginning, I was researching and asking what other chefs did in the past years. I started to get confused and at the end I stops asking and researching and decided to do what I like and what surprise I would like if I was a judge. Since the event starts very early, I would suggest to get there with all your prep ready and have a good sleep the day before, it's a long day! If you could be any Heritage Bred Pig, which one would you be? I am going to work with the same beautiful pig I use in Miami LARGE BLACK from Maverick meats.